I recently read an article titled; “Tech hiring accounts for 10% of U.S. employment gains” and a quote by David Foote, chief analyst, caught my eye, “While the pace of job creation in the national labor force appears stuck at 7.6% unemployment and new jobs are heavily in part-time positions and low wage full-time segments, IT jobs have been on a sustained growth upswing and wages are holding steady if not growing slightly.” What does this all mean? How does this apply to the market in Syracuse, New York? Here at C.R. 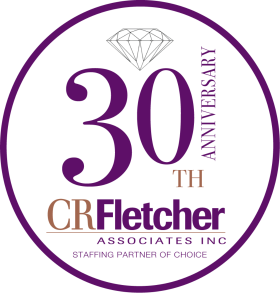 Fletcher Associates our Information Systems Recruiter, Elizabeth Eley, gave me a better understanding of the IT world, jobs she recruits for, why candidates should be using C.R. Fletcher, and information about herself. Elizabeth is a graduate of Wheaton College. When asked why IT recruiting, Liz shared that IT recruiting is a good mix of learning the technical, but interacting with people too. If you are interested in learning more about the article quoted above please click on the link below.